One Sweden customer need one element use for a personal alarm,his alarm sound is a sound wailing between 2khz and 5khz. Our products are widely used in electric appliances,such as blood glucose meter,remote control. Changzhou Cre-sound Electronics will attend Munich Electronica 2016 from Nov. 8 to Nov. 11. SMD Piezo Buzzer is our featured products with small current ,can be divided into active and passive production capacity can reach 20K/day for each type,the mini one is 9*9*1.8mm,the max one is 23*11mm. SMD magnetic buzzer has small size,the mini one is 4*4*2.0mm,the max one is 14*11mm,the sound can be on the top and side,white and black.They are our featured products can be divided into active and passive. The smallest size is 14*7.5mm,and the biggest one is 42*21mm,the sound can be made continuous,pulse ,siren.The sound pressure level can reach 105db,they usually use for home Appliances. This series usually use for smoker alarm, the sound pressure level can reach 85db at 3m.we have sizes range(22mm-40mm)for your choices. We have four models of ultrasonic annuncitor LDG30,LDG38,LDG41,LDG51 ,they the rated frequency range is 2.5-50KHz,they usually use for rat repellent ,mosquito repellent. Mechanical BuzzerLMB2316,LMB2615W,LMB2617W, LMB2316W usually use for solar energy,according to different installation methods can be divided into pin type and pin type. Internal-Driven magnetic buzzer can be driven by DC voltage,sizes range:9.0-16mm.usually use for washing machines, air-conditioning units and so on. External-driven magnetic buzzer is passive type, use for intelligent door locks,washing machines, air-conditioning units,sizes range:9.0-25mm. 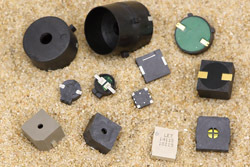 We have SMD piezo speaker,PCB speaker,wire speaker with different size 15mm-64mm,usually they use for mobile, telecommunications, automobile and so on.